The dates for the 2016 competition have been announced. Prizes will be announced soon. The NZ Brass Foundation is extremely pleased to announce the finalists for this years Young Brass Musician of the Year Competition. cornetist Megan Gooding (Invercargill), trombonist’s Dale Vale (Wellington), Andrew Yorkstone (Christchurch), and euphonium Luke Spence (Wellington) will all vie for the top brass prize in New Zealand and a winners cheque of $1000, with 2nd prize taking home $500, and 3rd $250. The final, being held at St Andrews on the Terrace on November 28 at 7.30pm, will be accompanied by the Champion Band of Australia and New Zealand - Wellington Brass, entry by gold coin donation. The evening will be a fantastic chance to hear the finest young brass players NZ has to offer, and this prestigious competition will certainly be hard fought for, with four very fine young musicians. 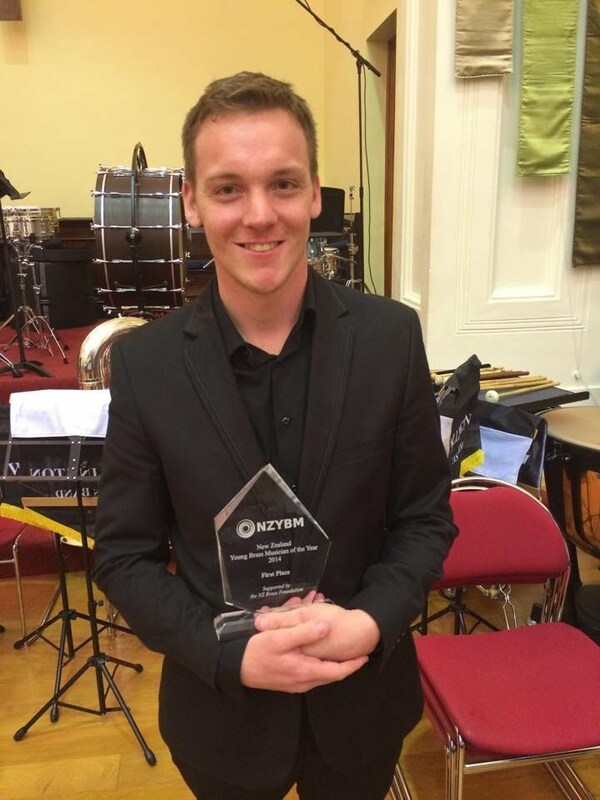 The 2014 Inaugural Winner, Kyle Lawson, was appointed to the Principal Cornet chair of the world famous Brighouse and Rastrick Band in the UK this year, and acknowledges the Young Brass Musician of the Year competition as a great springboard for his career - "The NZ Young Brass Musician of the year helped me gain valuable performance experience, focus and drive for future performances, and has played a massive part of where I am today"
The NZ Brass Foundation also thanks ABI Music and Sshhmute.com for their support of this years event. 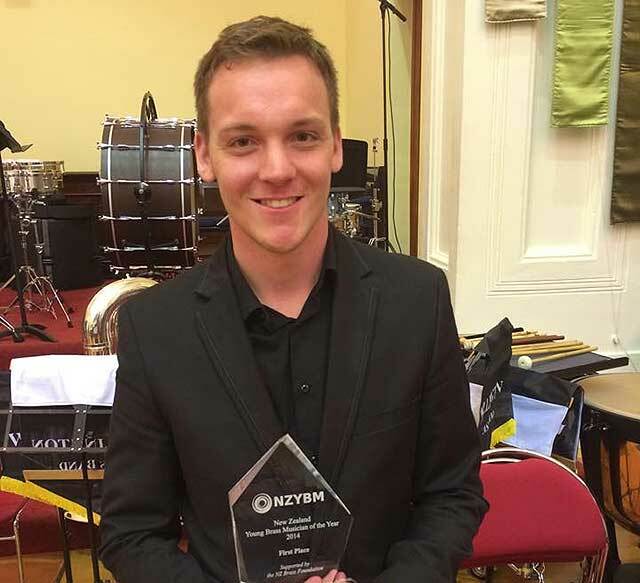 22 year old cornet player Kyle Lawson wins the first New Zealand Young Brass Musician of the Year title in Wellington. The final of the inaugural New Zealand Young Brass Musician of the Year competition took place in Wellington last Wednesday evening. Held at St Andrew’s on The Terrace, the event with its accompanying $1000 first prize was won by Kyle Lawson, a 22 year old cornetist in the New Zealand Army Band and principal cornet of Woolston Brass. Kyle (above) will now be the featured guest soloist with two of the country’s top bands, Woolston Brass and Dalewool Auckland Brass. The competition, very much in the mode of the BBC Radio 2 Young Brass Soloist Competition in the UK, is open to all brass players in New Zealand aged between 16 and 25, and offers the opportunity to showcase their solo talents in concert with full brass band accompaniment. The first round saw soloists provide a video audition of between 8-15 minutes, consisting of a solo performance with piano, brass band or recorded backing track accompaniment. Jurors David Bremner (Principal Trombone New Zealand Symphony Orchestra) and Philip Johnstone (Bandmaster NZ Army Band), then selected five finalists who presented a programme of 20 minutes accompanied by New Zealand National Champion, Wellington Brass. David Elton (Principal Trumpet of the Sydney Symphony), who joined the panel for the final, commented that Kyle’s performances of ‘Napoli’ (H. Bellstedt),’Believe Me if All Those Endearing Young Charms’ (D. Hunsberger), and ‘Tucker’ (E. Leidzen), were delivered with complete control, enhanced with beautiful a tone which held the audience’s attention from start to finish. The exceptional line up of finalists saw 21 year old cornet player Kieran Smith perform ‘The Debutant’ (H. Clarke), ‘Pastorale’ (G. Richards), and ‘Song and Dance’, (P. Sparke), with 22 year old trombonist Andrew Yorkstone playing ‘Clouds’ (A. Ritchie), and ‘Morceau Symphonique’ (A. Guilmant). Luke Spence, a 19 year old euphonium player performed the second movement of the Horovitz ‘Euphonium Concerto’, and ‘Pantomime’ (P. Sparke), whilst 16 year old cornetist Toby Pringle, delivered ‘Rhapsody for Cornet and Brass Band’ (G. Langford) and ‘Pastorale’ (G. Richards). The competition was founded and organised by Byron Newton with the help of the New Zealand Brass Foundation who provided the prize money and flights for the finalists. 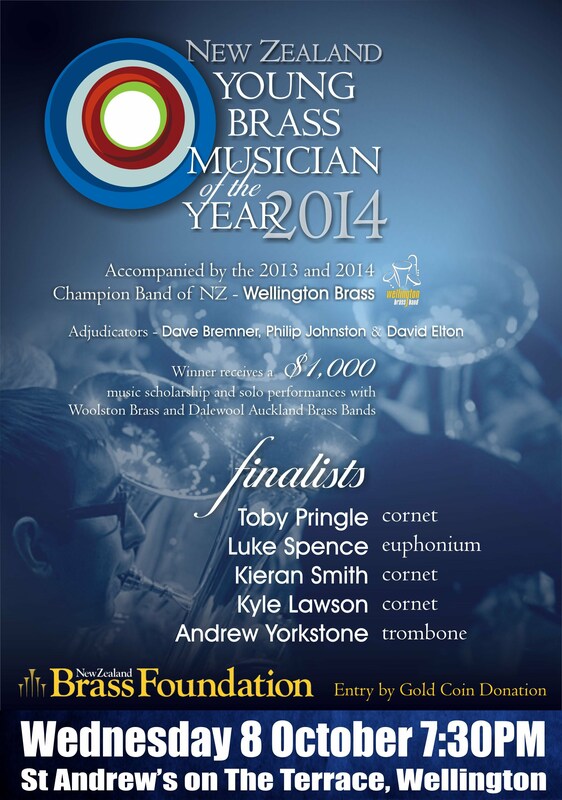 We are thrilled to announce the finalists of the New Zealand Young Brass Musician of the Year 2014. They are, in no particular order: Luke Spence (euphonium), Kyle Lawson (cornet), Andrew Yorkstone (trombone), Kieran Smith (cornet), and Toby Pringle (cornet). Our two adjudicators, Philip Johnston and David Bremner, were incredibly impressed with the standard of applicants, and joined by David Elton (Sydney Symphony Orchestra), they are looking forward to the Final where they will be naming the inaugural winner of the New Zealand Young Brass Musician of the Year. The Final will be held on the 8th of October 2014 at St Andrew's on The Terrace starting at 7:30pm. The winner of the 2014 NZ Young Brass Musician of the Year will be offered two solo engagements for 2015 with two powerhouses of New Zealand banding the Woolston and Dalewool Auckland Brass Bands. Between them Woolston and Dalewool have been the dominant bands through the decades and continue to lead the way in concert and in contests. Both bands are extremely happy to support the competition and look forward to hosting the winning musician in 2015. The jurors for the 2014 competition have been named. NZ Brass Foundation trustees David Bremner (NZSO, Wellington Brass Musical Director) and Philip Johnston (Bandmaster NZ Army Band) will select the finalists from the audition round before being joined by Sydney Symphony Principal Trumpet David Elton (pictured) for the final in October. For more on the jurors click here.